Well, my fragrance loving friends – I find myself back at it again. My passion for luxury candles may one day be my downfall. 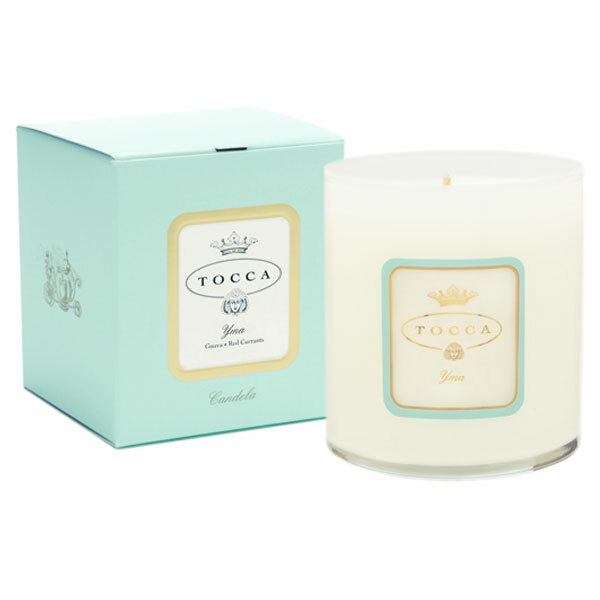 But until then I thought I might share my most recent “discovery” – Tocca candles. Tocca, meaning ‘touch’ in Italian, created an exciting line that rocked the fashion world in 1994. From there they began to incorporate beauty and fragrance products and in 1997 they expanded to include a luxurious candle line. The rest, as they say, is scent-able history. Tocca is known worldwide for simplicity, beauty and sophistication. It’s no wonder these candles often find themselves the latest talk of the town. And it’s no wonder that this curious cat wanted to find out just what the hype was all about. What did my Tocca candle look like? Why do I love luxury candles so? Not only for the complex, out-of-the ordinary scents that can be found, but also for the way they can make me feel. Yes, I’ll admit it. Luxury candles can make me feel special…pampered…like a princess. My initial exposure to Tocca candles was just as expected. I felt a little glee just holding the box – a serene blue-green color with a gold-embossed logo on one side. The Tocca name was prominently displayed with my chosen scent name, Yma, scrolled in cursive just below. Opening the box, I found a nice surprise. The phrase “Love yourself” printed in the same cursive font just on the inside of the lid. Well, alrighty then! An insert reminded me I was entering the Tocca experience. Ok, ok…enough about the box. What about the candle? Ahhhh, sheer beauty. I had bought this candle some time ago and it was a clear glass jar with the Tocca logo clearly displayed. (It’s my understanding that they have a new look now, a frosted jar. Perhaps this deserves further investigation!) The wax (a paraffin blend) was pure white with a single cotton wick (lead and zinc free!). The candle size was 10.6-oz and slated to provide you with 60 hours of fragrance bliss. What did my Yma candle smell like? I anxiously lit this candle and left it for a few moments to await the Tocca magic. Folks, I did not have to wait long. At all! In about 30 minutes I could easily detect this scent in the small room where it was burning. The red currant scent blossomed and became more prominent. The fruitiness from the guava became more noticeable during burn-time. This was not a candy-sweet fruity type of scent. More of a sophisticated fruity scent with a bite. Although not mentioned, I thought I detected some creamy vanilla notes at times. I’m not quite sure. But all in all this was a fantastic scent. The scent traveled throughout several rooms – amazing for such a small candle! Was it overpowering? No. But definitely filled the room it was in and very easily detectable in a couple of nearby rooms. I was truly impressed! Have you tried Yma from Tocca? Review it with us. In the comment section below, review and star rate your experience… it’s easy! Yma Luxury Candle - Tocca - The savory essence of the Peruvian guava fruit combined with the luscious scent of red currants inspired by the legendary singer Yma Sumac.